Hi Friends! Welcome back to Healthy Grocery Girl! I love the New Year. We put away all the Holiday decorations and the house feels fresh, open, airy… and full of possibility! In 2018 I had a baby and while I knew it would take some time to “bounce back”, the reality is that I had to slow way down and embrace an entirely new lifestyle. A new life that I love and at the same time a new life that I’m still getting used to. Along the way, I’ve developed strategies that help me feel healthy and strong physically, emotionally, mentally and spiritually. 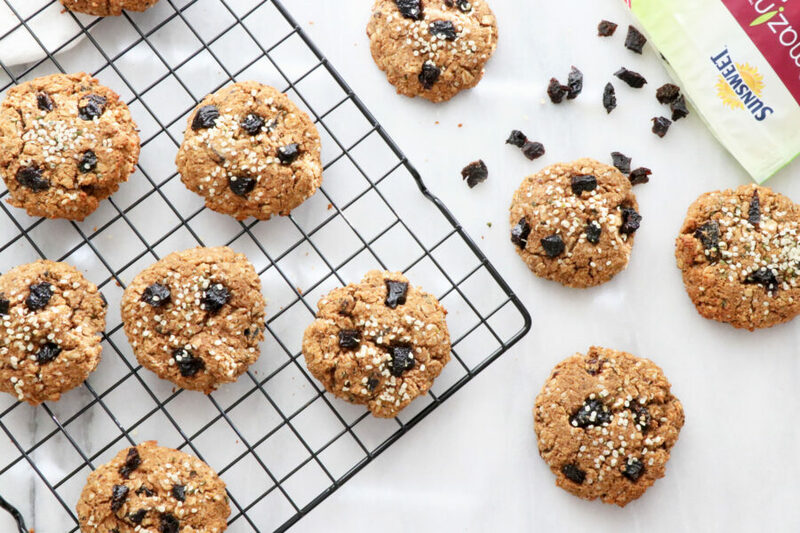 Today I’m sharing with you some of the healthy habits I strive to implement every week to feel good as well as a cookie recipe that’s packed with protein, fiber and energizing carbohydrates to power you through your productive day! For meal prep inspiration, I love referring to our Healthy Grocery Girl Meal Plans… you can learn more here! I love the HGG seasonal Meal Plans and also the HGG Clean Start Program. I keep meal prep really simple and prepare 1 or 2 complete meals such as a soup or pasta salad, one ingredient that helps make meals speedy like cooked grains or sweet potatoes and one snack like chia pudding, energy bites or muffins. Another recipe I love to meal prep is muffins or protein cookies. Life is busy for everyone and these are a great grab and go, eat with one hand, nourishing breakfast or snack option. Right now, I’ve been loving these Prune Protein Cookies (recipe at bottom of blog post). I have one mid-morning with a cup of tea while Ella naps and I power through some work emails! The protein in these cookies comes from the oats (yes, oats have protein! ), nut flour, nut butter and hemp seeds. I love adding dried fruit to my cookies and prunes add naturally sweet flavor and compared to other dried fruits, prunes are lower in naturally-occurring sugar. They have a low glycemic index of only 29! This means they are digested and absorbed slowly by the body, which helps to sustain energy over a longer period of time compared to higher glycemic index foods. Sunsweet Amaz!n Prunes have no added sugar and are an all-natural source of fiber with 3 grams of fiber per serving! My number one tip for meal prep is to keep it simple and do what works for you! You do not have to prep full meals or every meal for the week. You can prep ingredients that make it easier to throw meals together. For example, wash and cut carrots and celery for snacking with hummus! Try cooking multiple servings of beans, rice or quinoa to make a power bowl. Every Sunday I love to prep a big pot of soup which becomes dinner on Sunday night and the leftovers are great for lunch or dinner the next few days. Sometimes I follow a Healthy Grocery Girl recipe and sometimes I wing it! It’s a great way to use up produce from the fridge and grains from the pantry. I simmer ingredients with nourishing broth, herbs and spices and it’s always so comforting and satisfying. Did you know that when you’re stressed you likely take short, shallow breaths? Your Sympathetic Nervous Symptom is activated and your body is in “flight or fight” mode. Chronic stress is taxing on the body, mind and emotions in so many ways. Some stressors we can’t avoid, but we can build techniques that help us better handle stress so that it doesn’t affect our body, mind or emotions in such a negative way. My favorite stress-fighting technique is deep slow breaths, which can help move the body towards a state of relaxation. Studies have also shown that breath work, known as Pranayama, and yoga can help reduce anxiety, pain, blood pressure as well support immune and digestive health. much I actually really needed it!Life can become routine and we often don’t even notice that we’re walking around in a state of fight or flight! Give it a try! Breathe in through the noise and then let out a big sigh so that you feel it in the back or your throat. Repeat for 15 – 20 seconds. How do you feel? Repeat this breathing technique multiple times throughout the day! EXERCISE GIVES YOU ENDORPHINS & ENDORPHINS MAKE YOU HAPPY! I cancelled my gym membership in the beginning of the year. This may sound crazy given my goal to exercise more in the new year… however with a baby, finding time and the energy to get out of the house and go to the gym was a real struggle. I love exercising, however the prep, the drive… it just eats up time in the day that I have little of to begin with. I am all about removing as many obstacles as possible to make fitness realistic and maintainable. We calculated the cost of our gym membership and decided that long term it was a better investment to purchase an elliptical (which we bought on Holiday sale!) for the home. I can now workout multiple times a week during Ella’s nap. Cardio gives me endorphins that boost my mood, make me happy and help relieve stress. I love feeling stronger after a workout, but even more than that, exercise is so important for my mental health. In addition to cardio, I love yoga. I’ve been practicing yoga for years and I love stretching my muscles and how yoga helps slow my mind. Yoga is great for stress and anxiety! I love a good warrior pose, downward facing dog, child’s pose and also Viparita Karani! Viparita Karani also known as “Legs Up The Wall” is a fantastic pose to do every day for 15 minutes! This pose can help send blood to your core to improve circulation, relieve swollen ankles, reduce stress & anxiety, improve digestion & help slow down heart rate. I sit at a desk most days for many hours (like most people) editing photos, editing videos, creating HGG meal plans & recipes… if you sit for long hours too, try this pose at the end of each day or before you go to sleep! It is a great way to help improve blood circulation, which is crucial for sending oxygen and nutrients to our organs as well as helping our organs function optimally. To do this pose… try & keep your bum as close to the wall as possible with your legs straight up against the wall, lay with your arms open or resting on your stomach & then just breath deep & relax for 15 minutes! This is also a great time to meditate! Try this pose every day and see how you feel in a few weeks! SHARE YOUR FEEL GOOD HEALTHY HABITS! I love learning from our HGG Community! What healthy habits do you implement during the week to help you feel your best?! Share with me in the comments below and share with Sunsweet by entering their #ToFeelGood Sweepstakes. If chosen, winners will receive $1,000 and a year’s supply of Sunsweet products. It’s easy to enter, all you have to do is post about your feel good on Facebook or Instagram using the #ToFeelGood #Sweeps. Or fill out the form on sunsweetsweeps.comand submit it. In a medium bowl add the oats, nut flour, pumpkin pie spice, sea salt and baking powder, coconut sugar and whisk together. In another medium to large bowl add the prune juice, egg, warmed nut butter, coconut oil, vanilla extract and mix together. The add dry ingredients to the wet ingredients, and mix well. Lastly fold in hemp seeds and diced prunes. Press dough into cookie shapes and lay flat on a baking sheet. Bake at 350 degrees Fahrenheit for 15-18 minutes and then let cool for 3 minutes before enjoying. Store in an air-tight container in the refrigerator and eat within 1 week. Disclosure: This post is sponsored by Sunsweet. I’m still learning how to balance and juggle life as a stay at home and work from home mom. After Ella was born I had to slow way down and embrace an entirely new lifestyle. A new life that I love and at the same time a new life that I’m still getting used to. Along the way, I’ve developed strategies that help me feel healthy and strong. Today on the blog I’m sharing with you some of the healthy habits I strive to implement every week to feel good as well as a Prune Protein Cookie that’s packed with protein, fiber and energizing carbohydrates to power you through your productive day!